Once your puppy knows the stay command you can move onto teaching it to wait. It is very important that your dog understands the difference between stay and wait so you do need to be very consistent with the usage. Wait command is different from stay as it means wait until I give you the next command or release you. (Stay means stay in that position and in that place until I return to you). The wait command is useful to keep your dog from charging through doorways or across roads before you are ready for it to do so. Dogs do not wait as they anticipate what is going to happen, so getting your dog to wait requires patience and having a good understanding of your dog. To train the wait command it is useful for you to know what they are best at anticipating and what they definitely find hard to wait for and what really excites them. There are a couple of methods I use to teach my dog to wait, one is at my back patio door, as he loved to go charging into the garden before the door was half open and the other method was to get him to sit and wait for his dinner. If you have a patio door, get your dog to sit, then put your hand on the door handle and say “wait” in a gentle but firm tone. Slowly open the door all the while ensuring your dogs rear end remains on the floor. If your dog lifts its bum before the door is fully open, slowly pull the door back towards you, saying “oops” (which is my word when he gets it wrong), close it and start all over again. Continue opening and closing the door until your dog does not get up to walk through the door when you open it. Once you have got to the stage where you are able to open the door fully without your dog moving, give it the release command (mine is “ok”), and praise. There is no need to treat, as the reward is your dog getting what it was waiting for. At first don’t leave it too long before giving your dog the release command, or you may be setting it up to fail. Gradually build up the time before you give your dog the release command. Practice this every single time you let your dog out. Eventually you will be able to walk out the door and have your dog wait on the other side till you give the release command. Note: If you have a secure front garden, you can also do this exercise at the front door, but for training purposes it is best that you can see your dog if it rushes out. This is great to use if your dog is food orientated. Hold your dogs dinner bowl in your hand and tell it to sit. As you bend down to place the bowl in front of your dog, say “wait”. If your dog moves, lift the bowl back up again. Keep repeating this and as soon as you have been able to put the bowl on the floor without your dog lifting its bum, give him your release command. 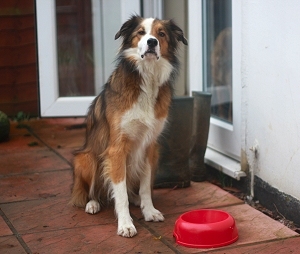 Do this every time you feed your dog, gradually increasing the wait time before giving the release command. Then try it walking away from the bowl. Eventually your dog should be able to wait for its dinner until you choose to give the release command and you will probably find that your dog will look at you waiting patiently for a sign that you are going to say the release command. Note: if you use this method, you must be consistent and use it EVERY time you give your dog its dinner. Another way of training the wait command, is place your dog in one room and ask it to wait. Leave the room and then call it to “come” to you. With practise, this will help your dog easily distinguish between “stay" and “Wait”. When you feel confident, you should practise both stay and wait commands in the same training session. Once your dog has an understanding of the “wait” command, use it regularly in daily situations, such as getting in and out the car, waiting to greet someone, waiting for someone to enter through your front door, waiting for you to go first through a gate, don’t forget to always use your choice of release command. When I command wait I do not always get my dog to sit first, as I now use the command a lot when he is ahead of me and I just want him to stop and wait for me to catch up. Tips: when training your dog do not overtire it, as it may fail, short regular stints of training are much better for holding your dogs concentration. If it looks like your dog is getting tired, finish up and always end on a positive note, with loads of praise and a reward.